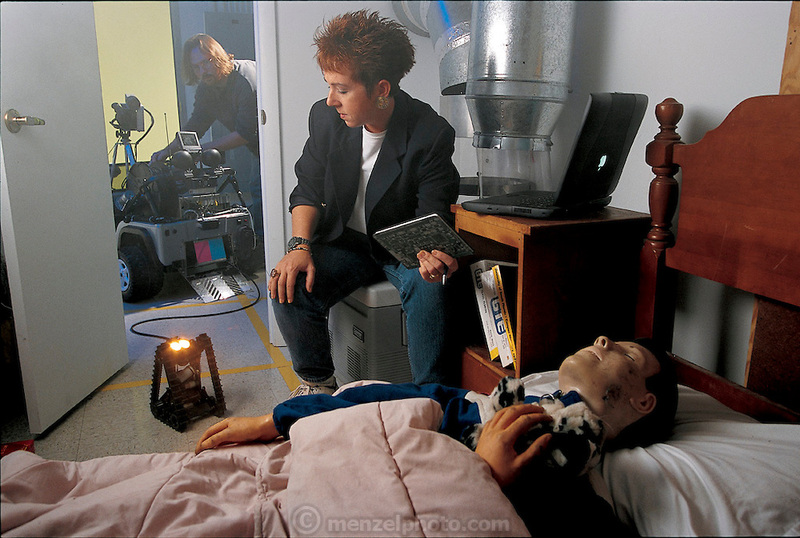 In a simulated bedroom complete with stuffed animals, tossed bedclothes, and a sleeping dummy victim, Robin R. Murphy of the University of South Florida keeps tabs on her marsupial robot; or, rather, robots. Developed to help search-and-rescue teams, the robots will work as a team. The larger "mother" is designed to roll into a disaster site. When it can go no farther, several "daughter" robots will emerge, marsupial fashion, from a cavity in its chest. The daughter robots will crawl on highly mobile tracks to look for survivors, feeding the mother robot images of what they see. Although the project is funded by the National Science Foundation and the Defense Advanced Research Projects Agency, Murphy's budget is hardly overwhelming. From the book Robo sapiens: Evolution of a New Species, page 154-155.